Avoid getting hit with its spear by using the well-guarded Jump attack to defeat it. When HP gets low, its attacks begin to get bold. Use big attacks to defeat it before it uses its explosive attack. 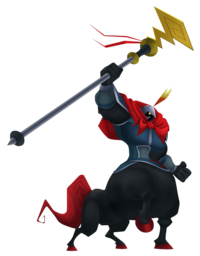 The Assault Rider is an Emblem Heartless that appears in Kingdom Hearts II. The Assault Rider is a centaur-like creature with a black, equine lower body with red hooves. Its upper body is muscular, vaguely humanoid, and has black skin. It wears grey Chinese armor over most of its body, as well as a small, conical, silver helmet with two curved, golden feathers and a red cape. Its pitch-black face is almost entirely obscured by its helmet, though its glowing, yellow eyes are visible. It carries a long guan dao with an angular, gold blade, a silver handle, and a red horsehair tassel at the base of the blade. 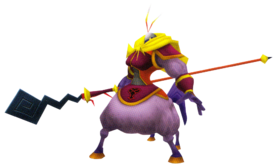 In Kingdom Hearts II Final Mix, the Assault Rider's body becomes predominantly lilac-colored, and its hooves become gold, and its hands and tail become violet. Its armor becomes red-violet and orange with gold lining. Its helmet, though still silver, is a bit brighter, its cape turns yellow, and its face becomes violet. The Assault Rider's guan dao now has a silver blade and an orange and purple handle, though the tassel remains red. The Assault Rider's name refers to its battle prowess, as "assault" means "to attack," and its equine lower body, hence "rider." The Assault Rider was originally intended to be included in Kingdom Hearts, but it was cut out, as no world really "fit well" with it. Getting close to this Heartless can really take a chunk out of the party's HP, and it can also take a large chunk out of the morale gauge during missions, so long-range magic is less dangerous. Although Assault Riders have powerful attacks, they will not attack unless they are in range at the beginning of a battle or are provoked. These Heartless get especially fast when their HP gets low. When fighting an Assault Rider during the first visit to the Land of Dragons, keep a distance and pelt it with magic, preferably Thunder or Blizzard. An alternative is to simply go to town with Valor Form, hammering the Assault Rider with as many combos as you can before the Form Gauge runs out. Guarding often is advised, and counterattacking afterwards is also a good decision. Be warned, when it stops flinching from Sora's attacks, stop attacking and guard or retreat before it attacks. During the second visit, use Master Form along with Wishing Lamp and Follow the Wind. Attack with combos and powerful magic, such as Thundara/Thundaga and Blizzara/Blizzaga. When the Assault Rider starts getting more aggressive with its attacks, do not hesitate to use Reflect magic.